Greetings from somewhere off the coast of Scotland, where my seat is as cramped as I said it would be. The white zone is for loading and unloading of passengers only. I won't say more. The big news back in London is that a British Muslim family was denied entry to the United States for a trip to Disneyland. No one is really saying why, but the British government says it will investigate. 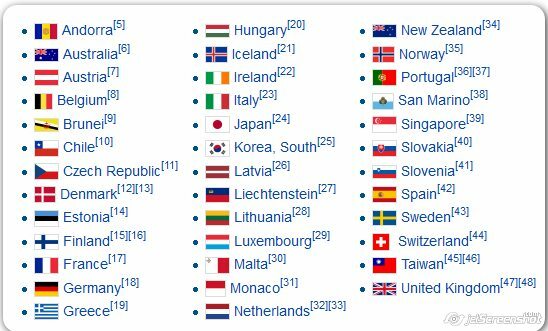 Britain is part of the visa waiver program (see the list above). 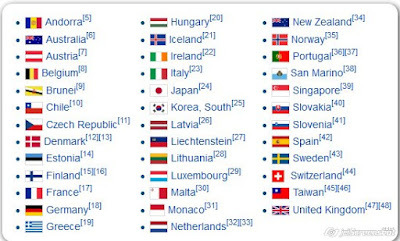 You know, the one that Israel cannot get into because we deny entry to too many 'Palestinians.' This is from the first link in this paragraph. Tariq Mahmood, 41, was due to fly from Gatwick on December 15 with his brother, Zahid, and nine of their children and nieces, for a holiday. But the family were told they could not board their Norwegian flight as they had been refused entry by the American authorities. David Cameron today said he would look into the case after it was highlighted by the family’s local MP Stella Creasy. Mr Mahmood, a gym owner from Walthamstow, told how the youngest children — aged eight — were in tears as they had to go home without any explanation for the decision. He told the Standard: “I still don’t know why. I told them we had our ESTA [US travel visa] approved six weeks ago. We’re just a normal, law-abiding family trying to go on our holidays. None of us have ever been involved in crime or mixed up in anything. Mr Mahmood, a Pakistani-born British citizen, was meant to be taking his daughter Hafsa, 14, and son Hamza, 18, to meet relatives in southern California before the family visited Disneyland and Universal Studios. The Mahmoods spent £9,000 on plane tickets and have been told they are not entitled to a refund. Apparently this is not the only British Muslim family to be barred from the US. After the column was published, Creasy was contacted online by other Muslims who claimed that they were barred from traveling to the United States. A well-known imam, Ajmal Masroor, also stated that his visa authorization was revoked earlier this month, before he boarded a Virgin Atlantic flight. He later wrote that he was invited to a meeting with the U.S. Embassy to clear up the matter — and hoped to set up a website that focuses on the issue. Maybe someone in the US is starting to take the terror threat seriously... no worries. Obama will put a stop to it.